Regions with a high level of fine-grained air pollutants have shorter life expectancies and an increased rate of death from a stroke, according to new research. The study, which surveyed counties across the United States, also found a link between poor air quality and higher levels of poverty and reduced access to affordable healthcare. In almost half of the areas surveyed “the annual average [pollution] was at a level considered acceptable. However, 51 percent of counties had an annual average exceeding” that limit, said Longjian Liu, a medical doctor and an associate professor of epidemiology and biostatistics at the Dornsife School of Public Health at Drexel University in Philadelphia, Pa., said in a press release. “To reduce the risk of stroke, clinicians should consider their patients’ likely exposure to air pollution along with other risk factors,” he said. Liu will present these preliminary results on 6 February at the International Stroke Conference in Honolulu, Hawaii. The researchers gathered air quality data from more than 1,550 U.S. counties from 2005 to 2010 from the U.S. Environmental Protection Agency (EPA). They focused on annual average levels of PM2.5­, a category of breathable particles around 30 times smaller than the width of a human hair. PM2.5 is a main cause of hazy or smog-filled air, and past research has connected it with heart disease and respiratory illnesses. Liu’s team found that 51% of the counties surveyed had annual average PM2.5 levels that exceeded the EPA’s air quality standard limit of 12 micrograms per cubic meter. Higher annual levels of PM2.5 were significantly correlated with both stroke mortality rate and life expectancy in men and women. 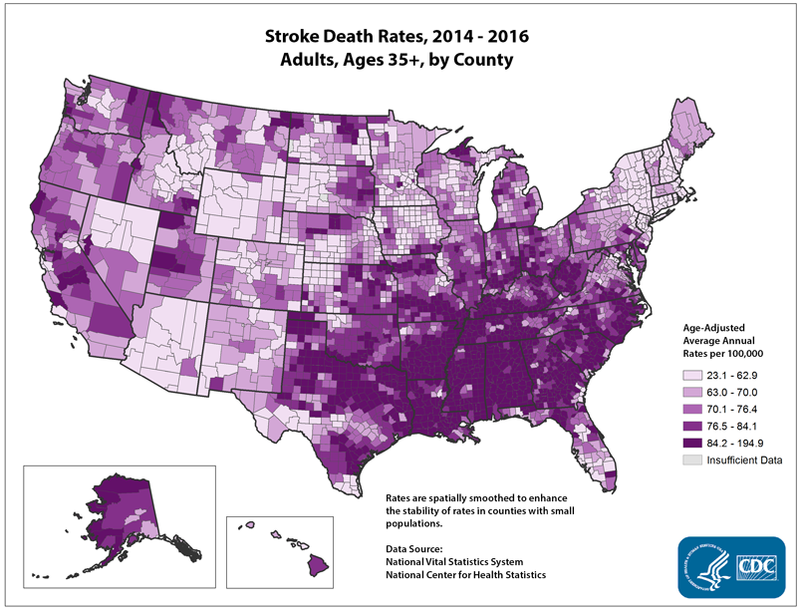 The team also gathered county data on stroke mortality, overall life expectancy, poverty rate, rural population percentage, and the number of primary care physicians per 1,000 residents from the U.S. Centers for Disease Control and Prevention. When they compared PM2.5 levels with health and demographic data, the researchers found that higher annual levels of PM2.5 were significantly correlated with both stroke mortality rate and life expectancy in men and women. Populations that breathe polluted air experience higher rates of death from strokes and have shorter life expectancies, the study concluded. Poor air quality hit hardest in counties with a higher percentage of people living below the poverty line and counties with fewer physicians per capita. Those factors are markers for whether residents have ready access to an affordable health care provider who can treat the effects of air pollution, the researchers said. When the team mapped out which regions experienced the strongest effects, it found that people living in southern states had the highest rates of stroke death and lowest life expectancies due to high PM2.5 levels, followed by those living in the Midwest, Northeast, and West. The intersection of poor air quality, lower income, and fewer doctors in southern states may help explain a phenomenon called the “stroke belt,” an 11-state region where nearly 8.5 times as many people die from a stroke than in other areas of the United States. “Places that are usually high in air pollution and other types of environmental risk are also associated with low socioeconomic status areas, unemployment,…access to medical care, and utilization of medical care,” Daniel Lackland, a doctor of public health and a professor of epidemiology at the Medical University of South Carolina in Charleston, explained in a press release. Lackland, who was not involved with this research, added that these demographic variables exacerbate lifestyle factors that increase the stroke risk from air pollution. On the basis of this research, Liu’s team suggests that primary care physicians begin to take air pollution into account when assessing patients who are at risk for a stroke. “Clinicians can then encourage at-risk patients to take measures to reduce their exposure when possible,” Liu said. “Avoiding major roadways during rush hour traffic, keeping car windows closed, and setting the air conditioner to circulate internal air” are a few options Liu suggested. Changing a commute to work or avoiding congested and industrial areas completely, however, might not always be feasible for low-income individuals. Citation: Cartier, K. M. S. (2019), Stroke deaths rise, life expectancy falls with polluted air, Eos, 100, https://doi.org/10.1029/2019EO115117. Published on 30 January 2019.